When a company sells a division, the restructuring that follows often creates a chance to review its values and vision, as JD Neuhaus UK managing director Steve Walker explains. 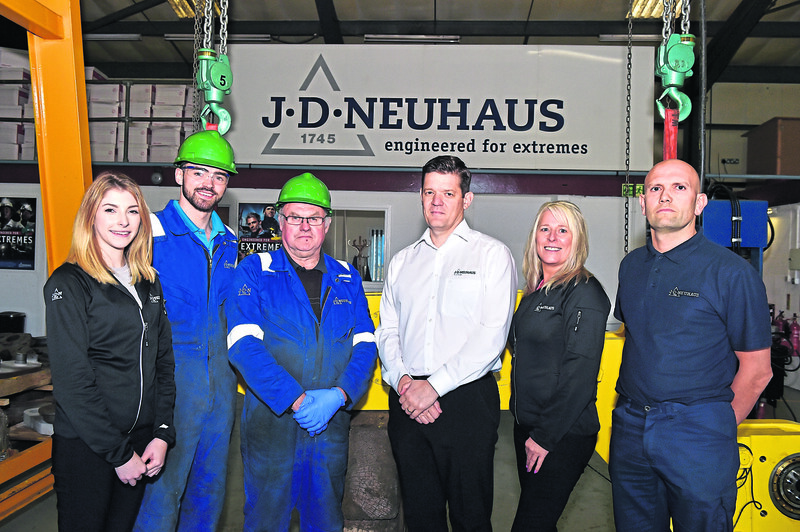 More than a year ago JD Neuhaus (JDN) sold the UK rental division of the company to LGH UK, but the business continues to serve the oil and gas sector with class-leading technology. By selling the rental fleet, Steve Walker was afforded the opportunity to allow the company to refocus on JDN Group’s global values from its head office in Germany. “I am of the firm belief that our specific values in the UK team will ensure we deliver our vision of growth over the next two to three years,” he said. JDN UK has spent the last year shaping and leading the team in the UK while moving into, and kitting out, their refurbished facilities in Kirkton Avenue to suit their needs. “We decided it was important to remain in the same area of the city to ensure that we can provide our customers with the same high level of service they have always received from us in the past,” said Mr Walker. With more than 200 employees across the JDN worldwide group, JDN has been at the vanguard of hoist and crane technology for more than 270 years, whether for moving heavy or light loads. Products are manufactured from a state-of-the-art facility in Witten, Germany. This globally unique specialisation means JD Neuhaus has set the quality standard for the market, a move that has seen the company become the established global leader in its technology field with customers in more than 90 countries worldwide. In the UK, JDN is highly focused on applications, sales and after-sales, including service and parts. The company has a streamlined and highly efficient workshop staffed by engineers and supported by a team comprising sales, after-sales, accounts and administration staff. JDN’s UK-based engineers also work in the field, providing customers with any required hoist or crane support. Strong relationships with oil and gas operators and service companies have allowed JDN to enhance its global reputation as industry leader for hoist and monorail systems. Very much part of JDN’s global brand and strategy, the UK business remains as robust as ever. Despite the sale of the rental business, the firm continues to grow its other UK divisions, which include sales and repair. Safety and reliability are primary requisites in the oil and gas sector. Here, JDN is adept at supplying hoists with a lift capacity from 125kg up to 115 tonnes, in line with ATEX certification. Furthermore, the 100% duty-free cycle of the equipment, which can be used directly in applications or as part of OEM material-handling devices, allows operatives around the world to work longer and harder. Customised lifting and control systems can be accommodated with load-test certifications available through DNV, ABS, Lloyds and others. Typical offshore equipment loads include BOP handling, FPSO vessel mooring/tensioning, and a wide range of general materials handling requirements on jack-up rigs, semi-submersibles and drill ships. On a global basis, the company has a worldwide sales, service and support network, working with major clients across the oil and gas sector. Recent service exchange contracts have taken place with major drilling companies such as Ensco, Maersk, Rowan and Shelf. JDN products were recently involved in preparation of the major decommissioning project in the North Sea for Shell’s Brent Delta platform. Mr Walker said the Brent Delta project was a unique chance for JDN to solve a major problem for its client with a bespoke hoist-and-trolley combination arrangement. “Our R&D team in Germany designed a trolley which allowed our 25-tonne hoists to operate safely at an angle of up 30 degrees while hanging off the underside of the rig,” he said. Brent Delta was the single biggest lift carried out in the North Sea sector. With a heavy focus on R&D, JDN ensures its range continues to evolve. Its latest products have been engineered to offer extended service life, simple operation and ecological compatibility, all without any compromise in safety or performance. The latest innovations from JDN include a remote-control concept that brings exceptional ease of use and convenience to users. Comprising a transmitter and receiver, the JDN-RC (remote control) is available for new and retrofit applications. The company’s range is broad and feature-rich, so virtually every type of general application can be served. Products include pneumatic cranes, C-rail/light crane systems, pneumatic hoists (PROFI, Mini and M ranges), manipulators, trolleys (including low-headroom versions), big bag handling hoists, ratchet hoists and monorail hoists. JDN was OEM supplier for the QUAD 204 project turret hoists. Mr Walker said: “This was an example of the JDN group working together to meet ongoing requirements at various stages of a key project. “Initially supplying the hoists through our French sister company for the construction phase, JDN UK became involved in terms of offering engineering support for the commissioning and final testing phase in the Norway. design straight through to the final sign-off. JDN has facilities in many of the world’s major oil and gas markets, including the US, Singapore, France, UK and Germany. All its products are engineered for extremes, and are proven to withstand the harsh operating environments associated with working offshore.